One thing I didn’t mention in my writeup of the wacky Gambler 500 road rally was that my Jeep overheated, and it was all my fault. When I returned from the rally, I frantically shipped off an oil sample to a lab to have it tested. That decision may have saved my engine’s life. A few weeks ago, I took my $600 Jeep Cherokee to a loony, junker-filled road rally in Michigan called the Gambler 500. The Jeep performed admirably, except it overheated once due to user error (as a former cooling system engineer, I have to point out that my cooling system was on point). So naturally, I popped the Jeep into four-wheel drive and hooned the crap out of my trusty steed, kicking up sand and revving the venerable 4.0-liter inline six that had faithfully taken me 4,000 treacherous miles to Utah and back. Getting up the hill, though, proved harder than I thought, as the engine began running out of steam as it tried overcoming both gravity, and the mounds of sand that those front tires kept wanting to push out of their way. My foot had the gas pedal mashed to the flimsy sheet metal acting as the replacement floorboard, but the Jeep slowed to a crawl. Then all the excitement came to an end, because I glanced at my temperature gauge, and it was pegged in the red. Then I looked near my shifter, where my electric-fan toggle switch is mounted, and my heart sank: I had forgotten to turn it on. Panic set in. I put the car in park and let it idle, giving it a few revs to get up the coolant flow and mechanical fan speed, but the temperature wasn’t dropping, so I shut off the motor, and it immediately began to heat soak. I stepped out, popped the hood, and feared the worst. Coolant hissed as it boiled over from my radiator cap into my recovery bottle. The fluid in the bottle was brown, which worried me, though I wasn’t sure how clean that recovery bottle was in the first place. I checked my oil level; it was fine. I let the Jeep sit for about 10 minutes, after which point, I cranked the motor back on, the coolant temp dropped, and the engine ran great. I drove the rest of the rally, and even towed my friend back for 100 miles; the Jeep was marvelous. I kept an eye on my oil and coolant levels throughout the trip, and everything looked OK. In general, a cracked cylinder head or a bad head gasket would lead to a milky, overly-full oil level, and a low coolant level. But everything checked out. Still, as someone who’s been wrenching on Jeep Cherokees for many years now, I know how prone 4.0-liter heads are to over-temps. I had this hunch—or maybe you could call it paranoia—that, even though all systems looked good, there was something was wrong. So I sent an oil sample in to Blackstone Labs, and for 28 bucks, they broke down its contents. I’ve shown you what one of Blackstone’s reports looks like in my post about my brother’s 12,000 mile oil change, and this report exactly the same thing. Blackstone’s test can give you an indicator of major engine parts wear (which you can derive from the iron, aluminum and chromium parts-per-million readings), bearing wear (copper, lead, tin), air filter effectiveness (silicone), resilience of oil wear additives as well as viscosity, and even whether you’ve got coolant in your oil. This last bit is the important part, and indeed, my hunch was right; unless there had been a pre-existing leak (which I doubt), my bone-headed mistake had cost me a cylinder head or just a gasket (my bet is on the head). 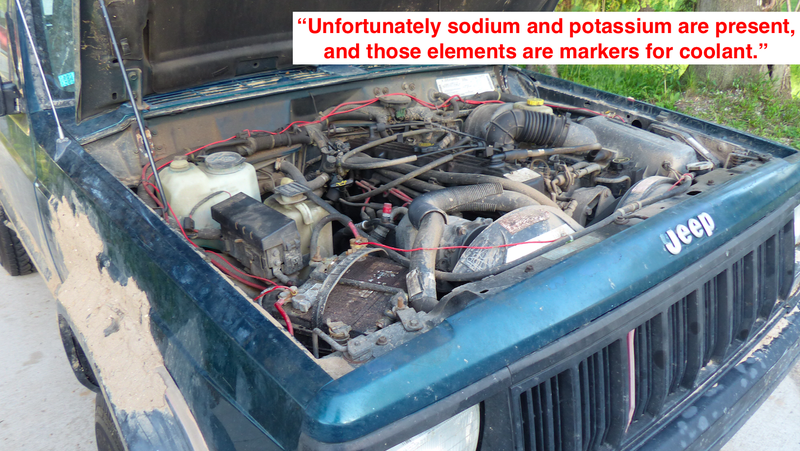 Both sodium and potassium, two antifreeze inhibitors, are present in alarming quantities. Unfortunately sodium and potassium are present, and those elements are markers for coolant. The good news is that you caught it early. The coolant hasn’t affected the wear. So that’s bad news, but also good news. I can fix this head or gasket problem, and my bearings will be none the wiser. My engine could come out of this completely unscathed, and all because my I let paranoia drive me to send in this oil sample. I’m relieved. But also a bit bummed.